Many young Irishmen arrived in Philadelphia in June 1832 aboard the John Stamp from Northern Ireland, looking for work. About 120 men ended up working in Malvern, near Philadelphia, for a contractor named Duffy, leveling ground in preparation for a train line to be constructed. 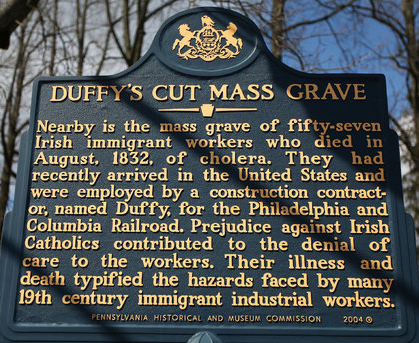 An outbreak of cholera that summer affected the men at their work site, which was called Duffy's Cut. The official count was eight dead, and the shanty that had been their living quarters was burned down and buried. Fast forward to 2002. Two brothers, William and Frank Watson, a history professor and minister, respectively, discovered among old family papers a file that their grandfather had had since the late 1960's. 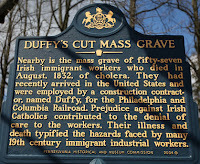 It had extensive information about the 1832 deaths at Duffy's Cut. The brothers became intrigued. They did historical research and then assembled a team to begin excavations at the site. Over the next few years they eventually began to discover artifacts and human remains from the time when the workers had died. The first body that was uncovered had a rare dental anomaly that connected it to families in County Donegal. By checking the passenger list from the John Stamp, the research group believed they had enough information to identify the young man, and his body was returned to the town from which he came. Nowadays so many stories focus on DNA being used to identify people. It was interesting to read about a different way to accomplish the task. You can read more about the research and excavations in a story from the New York Times. 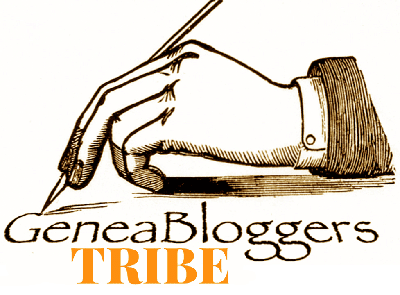 My thanks to Stephanie Hoover for posting about this interesting article. Follow-up: Five bodies that were recovered from the site but who could not be identified will be reburied in a Philadelphia cemetery. Other bodies that have been located using ground-penetrating radar cannot be recovered because they are too close to active rail lines. Another update to the story of those killed at Duffy's Cut: The body of one of the few women in the group is being returned home to County Tyrone for burial.